Nephi, the boy from Jerusalem who penned the earliest part of the Book of Mormon, had what is probably the most vivid vision of future events of any prophet, past or present. (Certainly is it the most vivid such vision we have on record.) A vision like Nephi’s – with such clarity and detail – is unprecedented within the current cannon of scripture. “As a truly great prophet with an unusually clear view of future developments, Nephi provides a vast sweep of God’s role in human affairs for the accomplishment of divine purposes.” Through Nephi’s vision, the reader gains a lucid understanding of God’s involvement in recent historical events. Historian Roy A. Prete has noted, “The blending of Nephite history with this wider vision of world history paints in broad strokes for the providential historian – at least for the historian who believes in the Restoration – a significant part of the canvas depicting God’s designs and purposes in modern history.” Among the future events Nephi witnesses, he sees, “Major chapters in the history of the development of America[, which] are thus transcribed in advance, with a clear indication that God has played a major role in them.” Today, when we celebrate the founding events of our country, I thought would be an appropriate day to post something on that part of Nephi’s vision. We interpret that to refer to Columbus. It is interesting to note that the Spirit of God wrought upon him…. I have no doubt that Christopher Columbus was a man of faith, as well as a man of indomitable determination…. In his reports to the sovereigns of Spain, Columbus repeatedly asserted that his voyage was for the glory of God and the spread of the Christian faith. Columbus is not the only one Nephi sees being lead by the Lord. Nephi then sees other Gentiles coming to the land of promise (see 1 Nephi 13:13-14), and he notes that “they did prosper and obtain the land for their inheritance” (1 Nephi 13:15). Thus Nephi sees the fulfillment of the Lord’s promise, but it is the Gentiles, not his family’s seed, that prosper. Nephi sees that they “did humble themselves before the Lord; and the power of the Lord was with them” (1 Nephi 13:16). Because of their wickedness, the seed of Nephi’s family had been cut off from the Lord’s presence. Now, another people had come to inherit the promised blessings of prospering in the land. The more we study Nephi’s vision in the Book of Mormon and compare it with the history of the American Revolution, the more we will appreciate and recognize God’s hand in assisting the American colonists to bring about their ultimate, and highly improbable, victory. The birth of the United States of America was truly a miracle wrought by the power of God, just as Nephi saw in vision over twenty-three centuries earlier. 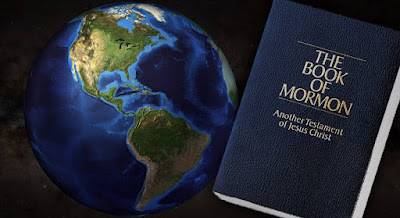 In the end, the promised land in the Book of Mormon is best understood as more than a specific location where ancient civilizations lived and died…. [T]he meaning of “promised land” is not exhausted by what geographers call “geometric space,” or empirically specified and fixed locations on the earth’s surface. Rather, the Book of Mormon equates the promised land with the places where sacred covenants govern human relations and where the blessings of the gospel are realized by covenant-based communities. In short, the Book of Mormon equates “promised lands” as the places where the plan of salvation is manifest in the lives of a covenant people. This sense of “promised land” is consistent with what geographers call “existential space,” that is, locations whose significance is defined primarily by experiential, not empirical and scientific, criteria. For this reason the effective center of Nephite civilization could shift successively from Jerusalem to “the land of our first inheritance” to the lands of Nephi, Zarahemla, and Bountiful without causing a spiritual catastrophe among the Nephites. In short, Book of Mormon authors identify their lands as “promised” on condition of the spiritual lives of the residents. Hence, the promised land is made such by the people who occupy it and choose to live in a way pleasing to God. For Nephi, these future events serve as an illustration of the divine promise that those who turn their hearts to God will prosper in the land, while the wicked will be cut off from God’s presence. While I harbor no illusions that this country was founded as “Christian nation,” I nonetheless maintain that the people who founded this nation were devout and religious men, who sincerely sought to do God’s will. For that reason, this land has been blessed, and the people have prospered. But when we, as a people, turn our backs against God, then there is the other part of the promise – the being cut off – which takes effect. The Book of Mormon serves as a stark warning to us today about what happens to the people when they are “ripened in iniquity” (see Jacob 5: 37, 58; Helaman 5:2; 6:40; 8:26; 11:37; Ether 2:9; 9:20). Much about today’s increasingly secular society gives me reason to fear for our future. But there is also hope. I pray that today, as we celebrate the founding of our nation, we may also take the time to acknowledge the role that God played in that founding. I further pray that we, as Latter-day Saints and regardless of political persuasion, may do all we can to see that we continue to steer this country in a direction which accords with God’s will and which allows us to bring down the blessings from heaven. I hope the same for the rest of world – may all people everywhere seek to make their homeland a “land of promise” blessed by God. I hope all will make this a matter of prayer. God bless America. God bless the world. Happy Independence Day! Roy A. Prete, “God in History? Nephi’s Answer,” Journal of Book of Mormon Studies 14/2 (2005): 37. Prete, “God in History?” 36. Prete, “God in History?” 36, brackets mine. Random Trivia: In a letter sent to his Abigail on July 3, 1776, John Adams expressed his expectation that July 2 – the actual day it was decided to declare independence – would be the day that would go down in history and be celebrated with parades and other festivities. Gordon B. Hinckley, “Building your Tabernacle,” Ensign (November 1992): 52. Quoted in Daniel C. Peterson, “Christ-Bearer,” FARMS Review of Books 8/1 (1996): 107-108. See Peterson, “Christ-Brearer,” 104-111; Daniel C. Peterson, “Not Joseph’s and Not Modern,” in Echoes and Evidences of the Book of Mormon, Donald W. Perry, Daniel C. Peterson, and John W. Welch, eds. (Provo, UT: FARMS, 2002), 198-203; Grant R. Hardy, “Columbus: By Faith or Reason?” in Reexploring the Book of Mormon: A Decade of New Research, John W. Welch, ed. (Provo, UT: FARMS, 1992), 32-36; Hugh Nibley, The Prophetic Book of Mormon, The Collected Works of Hugh Nibley: Volume 8 (Salt Lake City, UT: Deseret Book and FARMS, 1989), 49-53; Louise G. Hanson, “Columbus, Christopher,” in To All the World: The Book of Mormon Articles from the Encyclopedia of Mormonism, Daniel H. Ludlow, S. Kent Brown, and John W. Welch, eds. (Provo, UT: FARMS, 2000), 68; Philip M. Flammer, “A Land of Promise, Choice Above All Other Lands,” in First Nephi: The Doctrinal Foundation, Book of Mormon Symposium Series: Volume 2, Monte S. Nyman and George D. Tate Jr., eds. (Salt Lake City, UT: Greg Kofford Books, 2007), 218-219. Nibley, Prophetic Book of Mormon, CWHN 8:53. See Flamer, “A Land of Promise,” 217-229; also see commentary in Brant A. Gardner, Second Witness: Analytical and Contextual Commentary on the Book of Mormon, 6 vols. (Salt Lake City, UT: Greg Kofford Books, 2007-2008), 1:232-235. Flammer, “A Land of Promise,” 226. See Flamer, “A Land of Promise,” 222-224; Kenneth L. Alford, “‘Delivered by the Power of God’: Nephi’s Vision of America’s Birth,” in The Things Which My Father Saw: Approaches to Lehi’s Dream and Nephi’s Vision, The 40th Annual Sidney B. Sperry Symposium, Daniel L. Belnap, Gaye Strathearn, and Stanley B. Johnson, eds. (Salt Lake City, UT: Deseret Book and BYU Religious Studies Center, 2011), 275-277. Alford, “Delivered by the Power of God,” 265. Quoted in Alford, “Delivered by the Power of God,” 275. Quoted in Alford, “Delivered by the Power of God,” 276. Alford, “Delivered by the Power of God,” 278. Steven L. Olsen, “The Covenant of the Promised Land: Territorial Symbolism in the Book of Mormon,” FARMS Review 22/2 (2010): 153-154.